Why should you trust this review? What's wrong with my deep fryer? Should you ﻿consider﻿ Air Fryers over Deep Fryers? 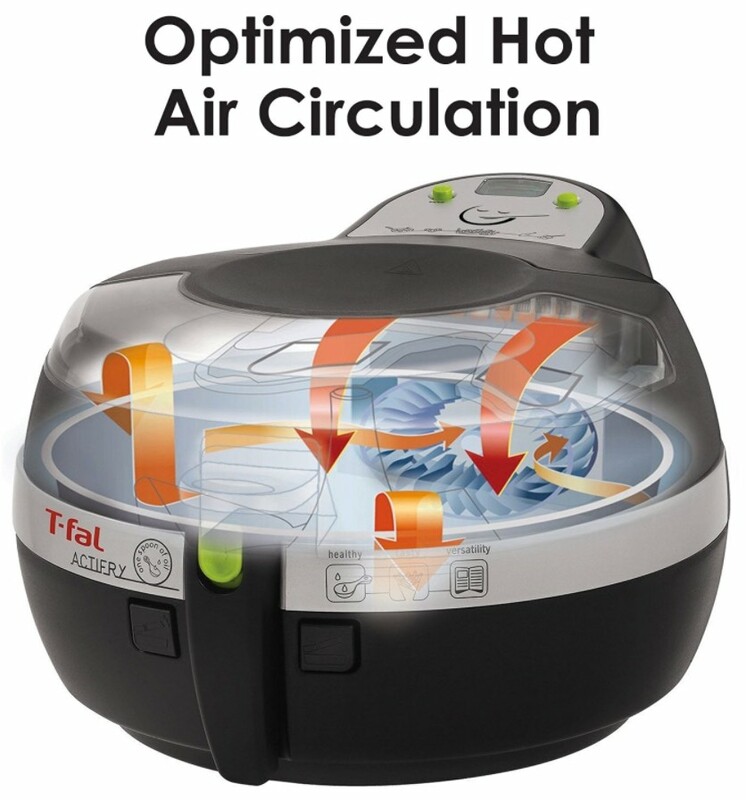 Where To Buy The T-Fal Acti fry Air Fryer? Did you know that on average, we use about 3L of oil when "deep frying"? Yes, you need that huge amount in order to "deep fry" your foods. And that's a lot. And have you dreaded cooking and sautéing in your house because of the greasy and oily smell that would be embarrassing if your in-laws or friends visits? Did you know that there's a kitchen appliance that can create those crispy fried, nicely browned (thanks to the Maillard effect), delicious and healthy foods? If you want to start cooking healthier meals, then this review and article is for you. I'm not a professional product reviewer. This blog is about the Paleo diet, but occasionally I'd like to share some of the tools and appliances I'm using because people are constantly asking me (C﻿﻿he﻿﻿ck out the resources page). I'm just another regular person like you who wants the best and healthiest food choices for my family. Now as a disclaimer, I'm linking the products to Amazon where you could find the best deals on this air fryer. Since I'm using my affiliate links that means that if you decide to purchase something from Amazon, I'll earn a small commission from it, but without any extra cost on your part. This helps us maintain this blog and provide tons of high value content to readers like you. Ever since we've invented "fried chicken" and "french fries" (sweet potato fries for Paleo), we've used a deep fryer to cook this delicious meal. Deep fryers allows for that crisp, browned, juicy meals. But is it the only way? Fortunately, because of hot air frying, we can now cook those delicious meals without the need for tons of oils. Which really equates to tons of fats added to your meals. Even if you're not health conscious, it's not good for your health to consume large amounts of fried foods on a daily basis. Which is why I'm sharing today what an air fryer can do for you. 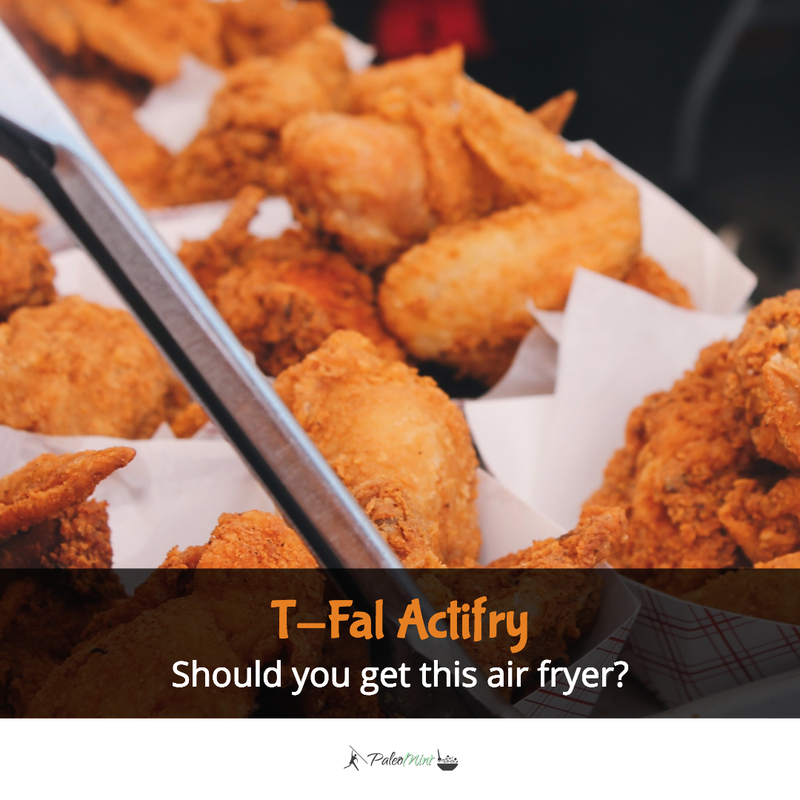 When looking to buy an Air Fryer like this T-Fal model, there are a lot of things that you need to consider. Let's start with the design or the "looks" of the kitchen appliance. You definitely don't want something that would look ugly on your kitchen countertop. While design and looks are highly subjective, personally I love black designs because they can match almost any color of Granite countertops. Just look at the T-Fal Air Fryer. That's a conversation starter, isn't it? On top of this Air Fryer, you'll be able to see the 2 buttons and an LCD which displays the time and settings. It has a clear cover which allows you to quickly see the status of what you are cooking. Other Air Fryers have no clear covers which makes it difficult for you to judge if what your cooking is already done. Opening the T-FAL Actifry is quite easy. There are 2 black buttons on the front and you can press either one or both to open this kitchen appliance. Once you've opened this kitchen appliance, you'll be able to see the non-stick coating pan where you'll be putting the food that you'd like to cook. It can fit a lot of food in here, about 2 pounds of french fries can fit inside this pan. In the middle is a paddle of some sort that can be easily moved and cleaned. The function of this paddle is to move and mix food while cooking to make sure all sides of your food are evenly cooked. There's a one-cup spoon for measuring oil. There are some recipes that would still require some oil, but only a tiny amount of it (one spoon). The handle in front with the green button can be pressed to use it as a handle for your air fryer. That's pretty much all the parts and features of this Air Fryer. Now, should you consider the T-fal as your next Air Fryer? It's entirely up to you. But here's more insights about it and I hope that it would help. There are dozens if not hundreds of Air Fryers available on the market today. 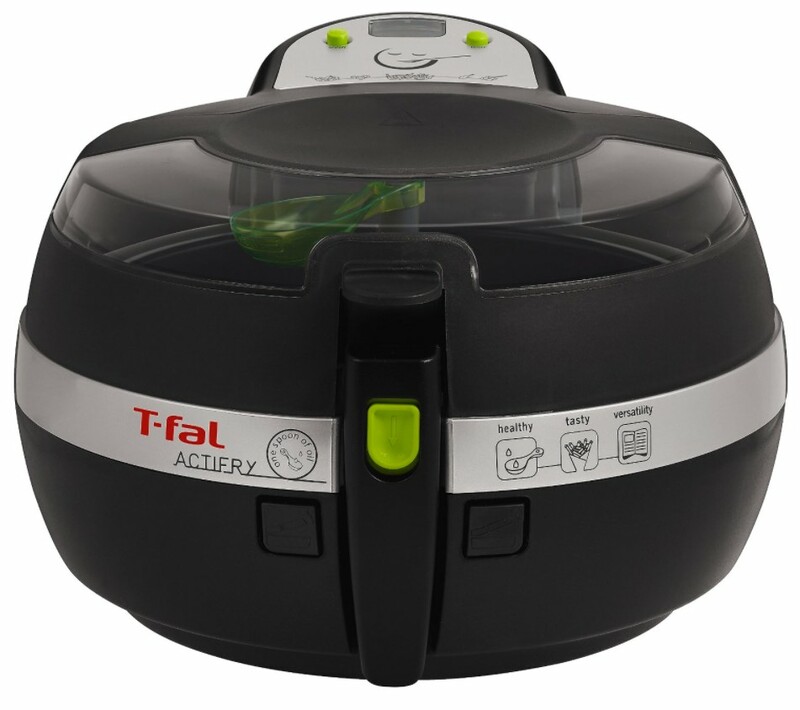 But the T-Fal Actifry is one of the best air fryers in 2017, according to the best seller rankings on Amazon. Personally, here are the reasons why I loved this Air Fryer. When I first used the T-Fal Air Fryer to follow one of the recipes that included sauteing onions and garlics, I was expecting my house to smell of oiled onions and garlic. But it didn't. It seems that the Acti Fry prevented my house from having those "odors" because the cooking was only confined inside the Acti Fry. That's a huge thing for me because I like to keep my house smelling oil/grease free. After doing more research on how Air fryers work (particularly this model), I've learned that Air Fryers are immediately on the 380 degrees range when cooking. That means that there's no need for preheating and for waiting for your meals to be ready. And tied to this technology of "heat pulsing and heat conduction", you're meals will be cooked evenly and without charring because of the precise cooking temperature. And lastly, because I've found the best deals on Amazon, I'm able to take advantage of great customer service at the very best prices. Of course, not all products are perfect, the T-Fal Acti fry included. But what I didn't like the most about this Air Fryer is that the timer is not really going to turn off the Air fryer. When the timer is done, it will beep, but you still have to turn off the air fryer or else it will continue to cook your food and potentially overcook it. It's probably one of those design flaws and with a temperature setting and auto-shutoff with the timer, it would be a 5 out of 5 stars kitchen appliance. Still, I'm using this air fryer almost on a daily basis. My kids love their fries (they're not on the Paleo diet yet), and I love to cook my sweet potatoes in there too. The chicken wings and savory chicken are heaven sent and an entire family delight. I didn't know that I can even use the Air Fryer to crisp wantons for authentic crisp desserts and snacks. One of my favorites is banana float with crisp wantons. Yum! While there's not yet a ton of reason on the subject matter, choosing which kitchen appliance is best for your needs is entirely up to you. But for me, I've decided on an Air fryer over a deep fryer because it has never left an oily or greasy odor in my house. I also knew that I'll only use small amounts of oil when cooking yet it still achieves those crispy dried foods I've always loved. I also loved the fact that there's no preheating and that allows me to cook my meals faster and perfectly. The fastest is being able to cook meals in under 8 minutes. And lastly when I'm done using this kitchen appliance, it's very simple to use and also very simple to clean. Some parts are even dishwasher safe. There are probably numerous kitchen appliance stores that sells this product. But you'll probably find the best deals on Amazon. Amazon is one of the world's if not the largest online retailer. And with an Amazon Prime membership (low fee), you'll be able to take advantage of the free shipping, world class customer support, and the most awesome deals/prices on the T-Fal Acti Fry.